WTI continues to cycle around $52 per barrel as recent market fundamentals have seen crude barrels get hung up on this week's consolidation. Traders remain confused as expectations that US production will continue to hold near all-time highs while OPEC and its allies are getting ready for 2019 production cuts to the tune of 1.2 million barrels per day. However, API's Crude stock is down to -10.18M barrel from last week's previous 5.36M barrel. Today's EIA US oil inventories are expected to print higher and the figure will most likely impact trading. Oil prices are still trading sideways after recovering from last week's lows of $49.3 per barrel and getting comfortable around the $52 zone. 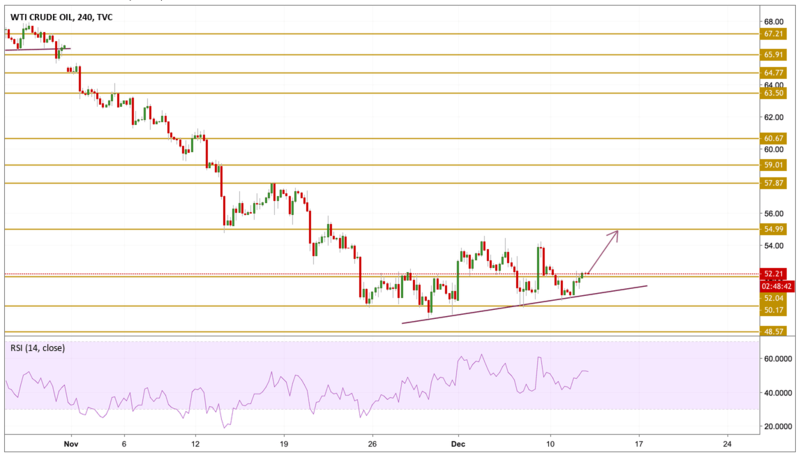 The price is currently consolidating just above the $52.04 support level with a neutral momentum waiting to get some traction to make an upward move. Today we will be focusing on the $54.99 resistance level.